From baby boomers to millennials, attending a big music festival has basically become a cultural rite of passage in America. In Half a Million Strong, music writer and scholar Gina Arnold explores the history of large music festivals in America and examines their impact on American culture. Studying literature, films, journalism, and other archival detritus of the countercultural era, Arnold looks closely at a number of large and well-known festivals, including the Newport Folk Festival, Woodstock, Altamont, Wattstax, the New Orleans Jazz and Heritage Festival, Hardly Strictly Bluegrass, and others to map their cultural significance in the American experience. She finds that—far from being the utopian and communal spaces of spiritual regeneration that they claim for themselves— these large music festivals serve mostly to display the free market to consumers in its very best light. Great read regarding the history of the music festival, very interesting to read what has changed and what aspects remain the same. 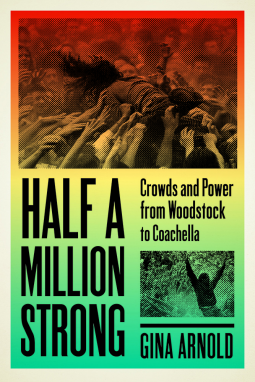 Half a Million Strong: Crowds and Power from Woodstock to Coachella by Gina Arnold is a cultural study of music festivals. Arnold is an American author, music critic, and academic. She is a lecturer at Stanford University and an adjunct professor at the University of San Francisco and the author of several books, including the 33⅓ book on Liz Phair, Exile in Guyville. Her doctoral dissertation was "Rock Crowds and Power: Race, Space, and Representation" at Stanford University. I almost passed on this book as I think I have read plenty on Woodstock and at my age, I really don't have an interest in Coachella. With a few exceptions, my appreciation of new music ended around the time David Lee Roth left Van Halen. What caught my eye was a festival many people have not heard of (but one I did attend) -- The 1983 US Festival. I attended Heavy Metal Day and heard Judas Priest, The Scorpions, Triumph, Ozzy Osbourne, Quiet Riot, Motley Crue and the headliner, Van Halen. I was the day a very drunk David Lee Roth yelled to the crowd that he forgot the f*cking words to the opening song. It was a significant buildup to a great disappointment, but that day it was estimated 350,000 people came to see them play. This was the mother of concerts as far as our  20-year-old minds believed. It also had a technology center, after all, it was Wozniak's creation. The US meaning to unify the people and canceling out the "Me Decade" was lost in the translation. It was, however, very 1980s with corporate banners and displays. It was the age of free reign capitalism although in 1983 it wasn't rubbed into the Soviets faces with a live simulcast to the USSR as it was in 1982. Arnold helped bring the memories back as well as pointing out the things I didn't know about outside of the music. Arnold looks at several festivals and how they influenced the times or reflected them. Bob Dylan going electric to Wattstax to We Are One, to raves and Blue Grass are covered along with a mention of Altamont. This is more than a history of festivals but a cultural examination of the events. Race plays a role in the music. Woodstock had African Americans in Richie Havens, Sly and the Family Stone, and Jimmi Hendrix. Most festivals did have African Americans playing for white crowds. It would be expected as Rock and Roll has its roots in rhythm and blues. The US Festival was almost entirely white bands playing for white people. Women are also a subject of the book. They are very much under-represented as performers and women, in general, have been targets of violence in more recent festivals. Half a Million Strong presents a social history of festivals in the United States and their evolution. Festivals have always been gatherings to see and experience the unrefined performance of your favorite bands. That experience is attempted to be captured in live albums, but still, they lack the visual experience and perhaps most importantly enjoying the music with thousands of people enjoying the same music with you.